Are you looking into the five transfer pricing methods, and wish to see examples of each? Below, we explain the common methods which you can use to determine transfer prices. We also explain for every method when, and how you should use it. After reading this article you’ll have a better understanding of the different methods and how they can be applied to your firm’s transactions. Before we continue, it is important to understand that the main purpose of transfer pricing methods is to examine the “arm’s-length” nature of “controlled transactions.” If these terms do not ring a bell, we advise you to first read our article What is transfer pricing?. What Transfer Pricing Methods Are There? The good thing about transfer pricing is that the principles and practices are quite similar all around the world. The OECD Transfer Pricing Guidelines (OECD Guidelines) provide 5 common transfer pricing methods that are accepted by nearly all tax authorities. Traditional transaction methods measure terms and conditions of actual transactions between independent enterprises and compares these with those of a controlled transaction. This comparison can be made on the basis of direct measures such as the price of a transaction but also on the basis of indirect measures such as gross margins realized on a particular transactions. The transactional profit methods don’t measure the terms and conditions of actual transactions. In fact, these methods measure the net operating profits realized from controlled transactions and compare that profit level to the profit level realized by independent enterprises that are engaged in comparable transactions. The transactional profit methods are less precise than the traditional transaction methods, but much more often applied. The reason is that application of the traditional transaction methods, which is preferred, requires detailed information and in practice this information is not easy to find. Traditional transaction methods rely on actual transactions. Traditional profits method rely on profit levels. As mentioned, the OECD Guidelines discuss five transfer pricing methods that may be used to examine the arm’s-length nature of controlled transactions. Three of these methods are traditional transaction methods, while the remaining two are transactional profit methods. The OECD Guidelines provide that you as a taxpayer should select the most appropriate transfer pricing method. However, if a traditional transaction method and a transactional profit method are equally reliable, the traditional transaction method is preferred. In addition, if the CUP method and any other transfer pricing method can be applied in an equally reliable manner, the CUP method is to be preferred. We’ll explain each of these methods in more detail now. The CUP Method compares the terms and conditions (including the price) of a controlled transaction to those of a third party transaction. There are two kinds of third party transactions. Firstly, a transaction between the taxpayer and an independent enterprise (Internal Cup). Secondly, a transaction between two independent enterprises (External Cup). In the article the CUP method with example we look at the details of this transfer pricing method, provide a calculation example and indicate when this method should be used. 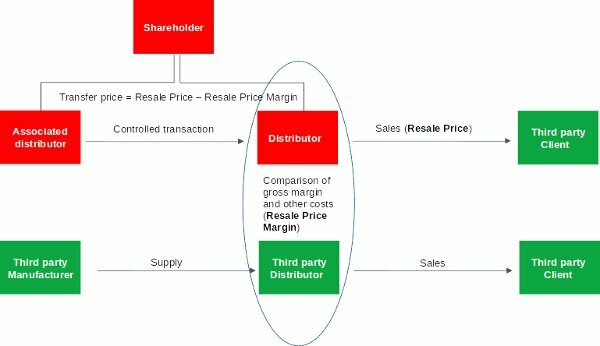 Then, the resale price is reduced with a gross margin (the “resale price margin”), determined by comparing gross margins in comparable uncontrolled transactions. After this, the costs associated with the purchase of the product, like custom duties, are deducted. What is left, can be regarded as an arm’s length price for the controlled transaction between associated enterprises. In the article the Resale Price Method with example we look at the details of this transfer pricing method, provide a calculation example and indicate when this method should be used. The Cost Plus Method compares gross profits to the cost of sales. The first step is to determine the costs incurred by the supplier in a controlled transaction for products transferred to an associated purchaser. Secondly, an appropriate mark-up has to be added to this cost, to make an appropriate profit in light of the functions performed. After adding this (market-based) mark-up to these costs, a price can be considered at arm’s length. The application of the Cost Plus Method requires the identification of a mark-up on costs applied for comparable transactions between independent enterprises. An arm’s length mark-up can be determined based on the mark-up applied on comparable transactions among independent enterprises. In the article the Cost plus Method with example we look at the details of this transfer pricing method, provide a calculation example and indicate when this method should be used. 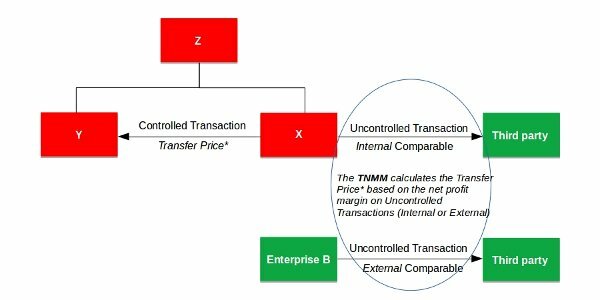 With the Transactional Net Margin Method (TNMM), you need to determine the net profit of a controlled transaction of an associated enterprise (tested party). This net profit is then compared to the net profit realized by comparable uncontrolled transactions of independent enterprises. As opposed to other transfer pricing methods, the TNMM requires transactions to be “broadly similar” to qualify as comparable. “Broadly similar” in this context means that the compared transactions don’t have to be exactly like the controlled transaction. This increases the amount of situations where the TNMM can be used. 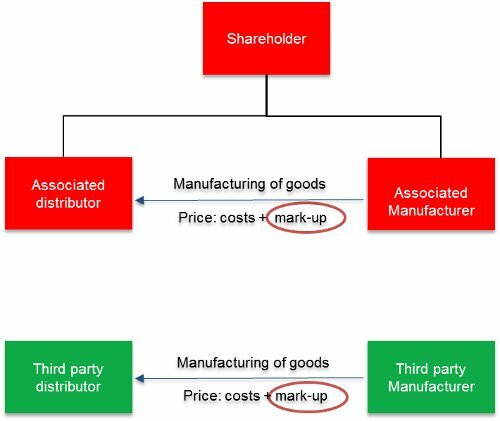 A comparable uncontrolled transaction can be between an associated enterprise and an independent enterprise (internal comparable) and between two independent enterprises (external comparables). In the article the Transactional Net Margin Method with example we look at the details of this transfer pricing method, provide a calculation example and indicate when this method should be used. Associated enterprises sometimes engage in transactions that are very interrelated. Therefore, they cannot be examined on a separate basis. For these types of transactions, associated enterprises normally agree to split the profits. The Profit Split Method examines the terms and conditions of these types of controlled transactions by determining the division of profits that independent enterprises would have realized from engaging in those transactions. In the above example, we see two comparable joint ventures. Joint Venture I is owned by associated enterprises Y and X. Opposite to that, Joint Venture II is owned by independent enterprises A and B.
Let’s say that we need to determine the transfer prices to be charged for the transactions related to Joint Venture I. For that, we can compare the terms and conditions of the controlled transactions by determining the division of profits of comparable uncontrolled transactions. In this example, this means that we can compare Profit Split I with Profit Split II. In the article the The Profit Split Method Example we look at the details of this transfer pricing method, provide a calculation example and indicate when this method should be used. Transfer pricing methods are quite similar all around the world. The OECD Guidelines provide five transfer pricing methods that are accepted by nearly all tax authorities. These include 3 traditional transaction methods and 2 transactional profit methods. A taxpayer should select the most appropriate method. In general, the traditional transaction methods is preferred over the transactional profit methods and the CUP method over any other method. In practice, the TNMM is the most used of all five transfer pricing methods, followed by the CUP method and Profit Split method. Cost Plus Method and Resale Margin Method are barely used. We hope you enjoyed reading this article. Do You Want To Learn More About Transfer Pricing? We created a complete Transfer Pricing Training program filled with practical information found nowhere else. Study transfer pricing at your own pace, whether you're an in-house or independent professional, or a student. ...is a boutique transfer pricing firm based in Asia. We help you deal with all matters related to transfer pricing. Are you interested in learning about transfer pricing? We created a unique and simple method for you to quickly master the theory and practice of transfer pricing. ...is a boutique transfer pricing firm based in Asia. We assist multinationals en medium sized businesses with all matters related to transfer pricing. What Is Transfer Pricing Documentation?